Protesters associated with the Occupy movement blocked traffic outside the Tampa, Fla., arena where the Republican National Convention kicked off today, leading to one arrest and police pursuit of several others who were "running through the downtown area," the chief of police said. A spontaneous march made up of 25 to 30 masked protesters originated about 3 p.m. at the "Romneyville" tent city, several blocks from the Tampa Bay Times Forum, site of the convention. "Individuals splintered off from that and have been basically running through the downtown area and we're monitoring them right now just to ensure that everyone is safe and that there's no damage in the downtown area, but so far everything has been very, very successful," Tampa police chief Jane Castor said. The man, Dominick Delarosa, 20, was arrested when he refused to remove a mask at the request of police. "There was a group of probably 25 to 30 individuals and many of them put on their masks," Castor said at a news conference. "They were told repeatedly by officers that was a violation of the event ordinance, that they weren't allowed to wear those masks in the event zone. "Everyone took those masks off with the exception of one individual. The officers again, gave him plenty of warning and leeway to remove that mask. He refused and he was placed under arrest." By 4:30 p.m., traffic outside the convention center was stalled. Hundreds of officers in riot gear surrounded the protesters, leading to delays to and from the forum. The protests came at the end of an otherwise anticlimactic first day of the convention. What was to be an opening day of pomp and partying stretching into the night instead lasted all of one minute, as the GOP put on hold its plans to nominate Mitt Romney while the Gulf Coast hunkers down in preparation for Tropical Storm Isaac. At 2 p.m. ET, party chairman Reince Priebus announced the convention "in session and called to order." He declared the convention in recess moments later with the pounding of a gavel. But Priebus still observed a moment of silence to recognize the first responders expected to deal with the effects of the storm churning its way toward New Orleans. 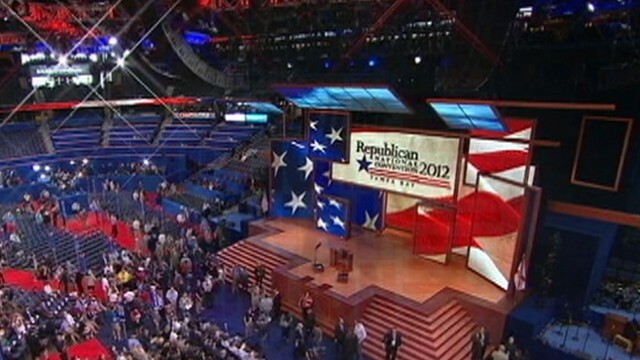 Many delegates were on the floor of the Tampa Bay Times Forum, but the seats of the huge arena were all but empty. Priebus also pointed out a special clock that will monitor increases to the national debt during the meeting though Thursday. Isaac, which is expected reach hurricane force winds in the next 24 to 48 hours, will now mostly avoid Tampa. But its dark clouds loom over the convention, nevertheless. Priebus and others in the coming days will strike a balance between respectfully monitoring the storm, and ebulliently celebrating their new nominee. This year's convention was to be a carefully scripted affair, tightly packing in speeches by many of the party's boldest names. By losing a day of events because of travel delays and bigger fears that the storm would hit Tampa directly, many speakers were rescheduled or simply canceled. Tuesday's schedule includes the roll call of state delegates' pledging their support for Romney as the nominee, as well as some of the party's fastest-rising stars, many of them long endorsers of Mitt Romney, including Wisconsin Gov. Scott Walker and New Hampshire Sen. Kelly Ayotte. The headliner Tuesday is New Jersey Gov. Chris Christie, once considered a potential running mate for Romney. Ann Romney, who was set to speak today, will also speak Tuesday. Meanwhile, on the sidelines of the convention will be a veritable sideshow of GOP presidential also-rans. Unbowed by the weather and by his losing presidential campaign, supporters of Texas Rep. Ron Paul came out in droves to hear him speak Sunday in Tampa, after he was nixed from speaking at the convention. Other one-time candidates -- Newt Gingrich, Herman Cain and Minnesota Rep. Michele Bachmann -- are also expected to hold events on the convention sidelines. Democrats also have set up outside the convention, hunkering down in a "war room" to respond in real time to comments made during the event.